It’s funny how, depending on what the destination, people will ask why are you going there. No one asked why I went to France. No one asked why I went to Mexico. I got why Ghana a fair amount. Not so many people are familiar with any country in Africa, so it was a great opportunity to share information. India, however, is not a small little-known country. 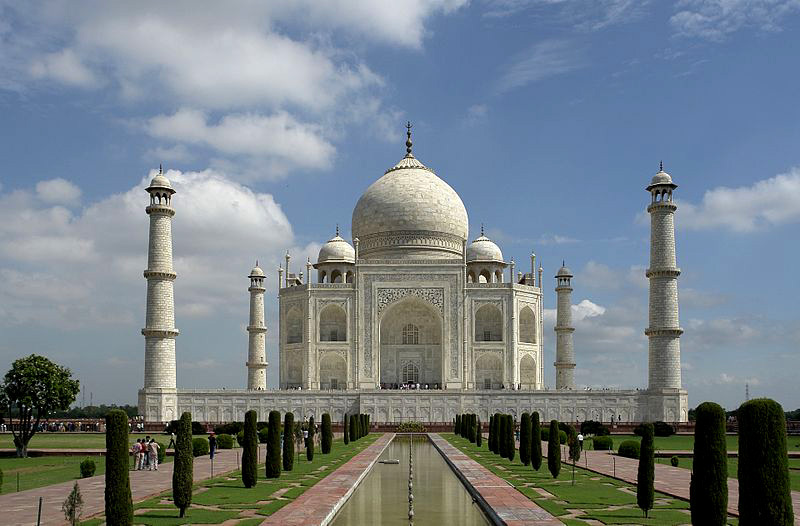 Everyone I talk to has some knowledge of it, and they all at least know about the Taj Mahal, India’s most famous monument. It’s been fun answering the question of why I’m going to India, and it’s made me think about it and examine my reasons a little bit. I may have been around fourteen when I read about the Taj Mahal for the first time. The love story behind its construction and the beauty of its design immediately inspired a desire to see it. Indian architecture is as diverse, complex and exciting as its cuisine. The multiplicity of religions has resulted in the construction of many different styles of temples, mosques and other places of worship that are inspiring to the eye as well as to the soul. A country which has been invaded numerous times, India’s many fortresses are as awe inspiring as the interior chambers are beautiful. Palaces and mansions add to India’s architectural confectionery. Cultures that are greatly different from my own are more fascinating to me than cultures which aren’t. I’ve got several European destinations on my travel wishlist, but each time I need to make a choice, places more remote and exotic win me over. I love the bright colors, the flowing saris, the fluttering salwar kameez and the glittering veils that Indian women wear. Indian clothing is graceful and beautiful, both men’s and women’s. “Indian cuisine,” I’m discovering, is a grossly inadequate phrase. The country is so vast, and there are so many regional specialties that that doesn’t tell you anything more specific than “European cuisine” would. I’m excited about trying some new dishes, but I’m also a little apprehensive. Indians are fond of chilies. Me, not so much. In Togo I once bit into what I thought was a green bean in my soup. It was a chili pepper so hot that it made my eyes water and my mouth burn for what seemed like forever. Regardless, I’m hoping that this will turn out to be more of a foodie vacation than I’ve ever had. Indians cook a lot with dairy products, which I love. 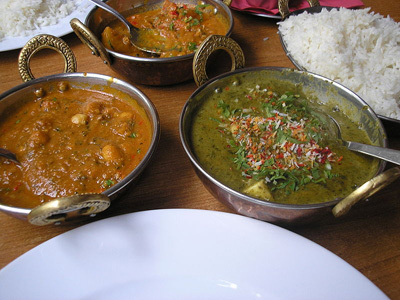 I’m really looking forward to eating my way through Rajasthan. And I’m planning on eating street food. There are so many things about India, its culture and its people that attract me, I could very likely stay here indefinitely and never discover them all. There are so many things that attract me to India, the question is less why India than why did it take me so long to go there. Day 1-3: Arrive in New Delhi. 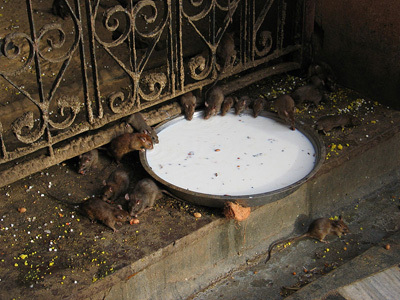 Spend the first few days exploring Delhi. Delhi highlights include Qutb Minar, Laxmi Naryam Temple and the Red Fort. Bikaner Camel Farm: photo by Dieser Benutzer. Day 5-6: Arrive in Bikaner. 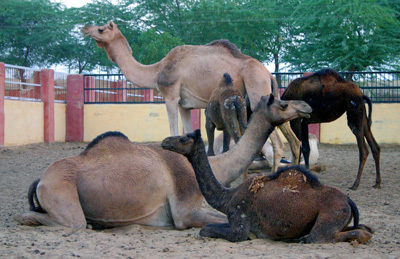 Tour the city, visit camel breeding farm, Junagarh Fort, Lalgarh Palace and Museum. Day 10-11: Explore Jodphur, the Blue City. Shopping reputed to be excellent here, with much lower prices than Delhi. Side trip to Salawas, a weaving village known for making dhurries (small rugs). Day 14: Udaipur, the Venice of India. 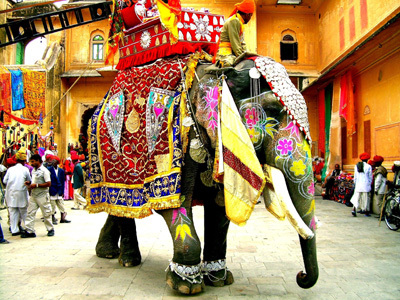 Indian Elephant at Jaipur: photo by Faraz Usmani. Day 17-21 Jaipur. Here’s where the Elephant Festival will happen. Seriously, if I see anything like the above, I’ll wet myself! Holi Festival is the day after the Elephant Festival. 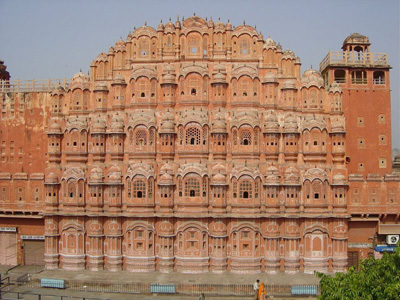 Hawa Mahal Palace, Jaipur. Photo from Wikimedia. 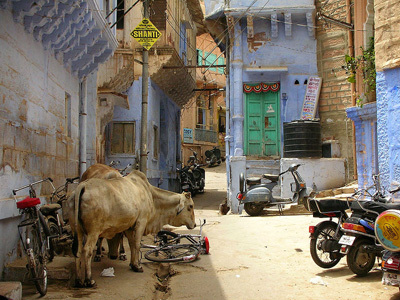 Lots to see in Jaipur, also known as The Pink City. Side trip to Sanganer to see how textiles are block printed by hand. Taj Mahal: photo by Yann. Day 23-24 Agra. 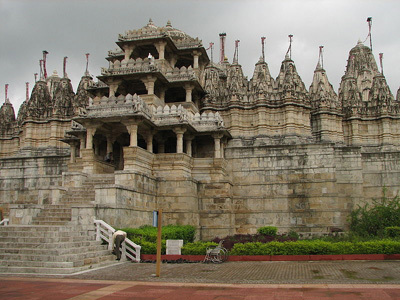 Visit Taj Mahal and various forts and temples. My visa has been processed and is being Fedexed back to me. I’m starting to check things off my predeparture to-do list. The trip is becoming real in my head rather than a far-off dream. Friends have begun asking me where exactly I’ll be going, so I thought I’d show you. India has 28 states and is roughly one-third the size of the United States. [Source: CIA World Factbook.] Since this is my first trip to India, the Taj Mahal is a must-see. After that, I found out about an elephant festival which determined what month I’d be there. Both the Taj and the elephant festival were not far from New Delhi. Then I started researching to find other sights that interested me. Most of these happened to be in Rajasthan. I’ll spend a few days in Delhi at the beginning and end of the tour. 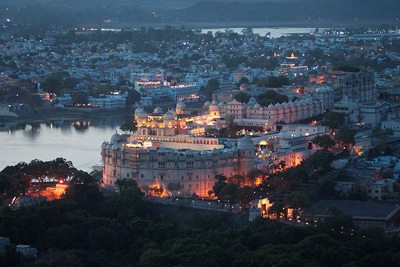 Most of my four weeks will be spent touring the state of Rajasthan. The Taja Mahal is in Agra, Uttar Pradesh, 253 kilometers (157 miles) from Delhi. It will be one of the last stops on the return to Delhi. 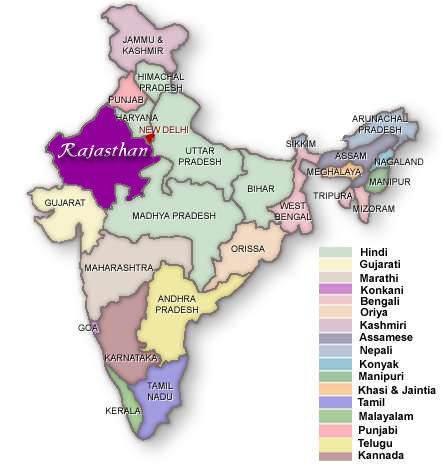 The map shows the states of India and the primary language spoken in each area. 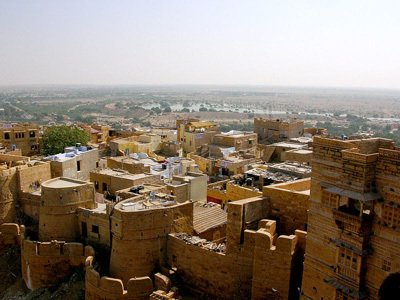 Rajasthan is an area where Hindi is widely spoken. 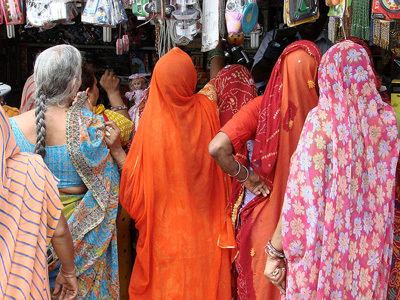 Both Hindi and English are recognized as India’s official languages. I don’t know any Hindi, but I’m sure I’ll pick up a few words once I’m there.